In mid February 2019, Tania Fraser and a few grade 11 students from Our Lady of the Southern Cross College came out to visit our store and learn some valuable tips about taking care of poultry. This provided a fantastic opportunity for our Merchandise Manager Ben Otto to share some of his agricultural knowledge with the next generation. We love to see the younger generation taking an interest in all aspects of agriculture... whether it be animals, cropping, sustainability, the environment or any other agricultural endeavour! 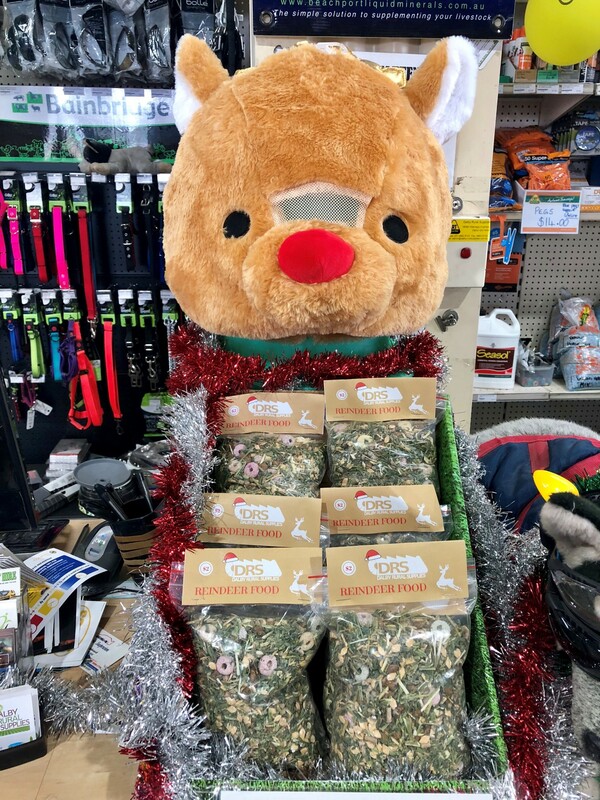 Once again, we decided to stock Reindeer Food in the lead up to Christmas 2018, so that we can cater for all our animal friends! This time we chose to raise funds for local girl Ivy Rogers and her fundraising effort Inspired by Ivy. A sincere thankyou to everyone who purchased the Reindeer Food and for helping a little girl be able to live a more normal life. For more information about Ivy, visit Inspired by Ivy. 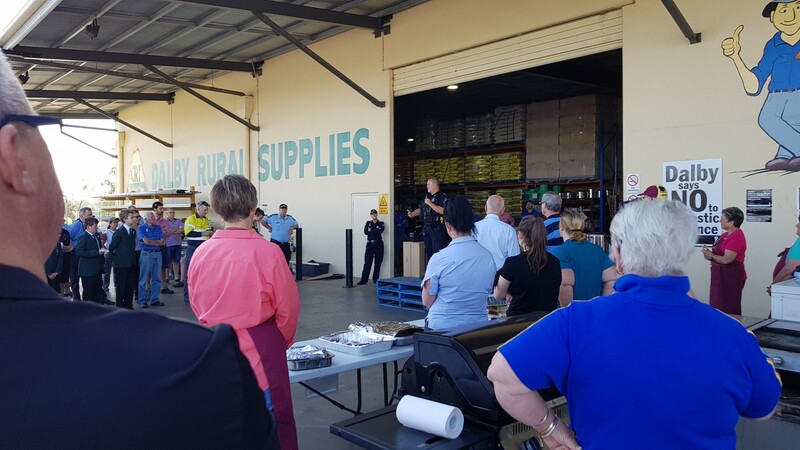 In November 2018, Dalby Rural Supplies hosted the local White Ribbon Day Dalby Blokes Breakfast. The event was a great success, with a fantastic attendence from our local community. We love to see our community come together for a great cause and saying 'no' to violence against women and children is definitely something we support! It's not too late to take the White Ribbon oath - 'I will stand up, speak out and act to end men's violence against women.' For more information, visit White Ribbon Australia. 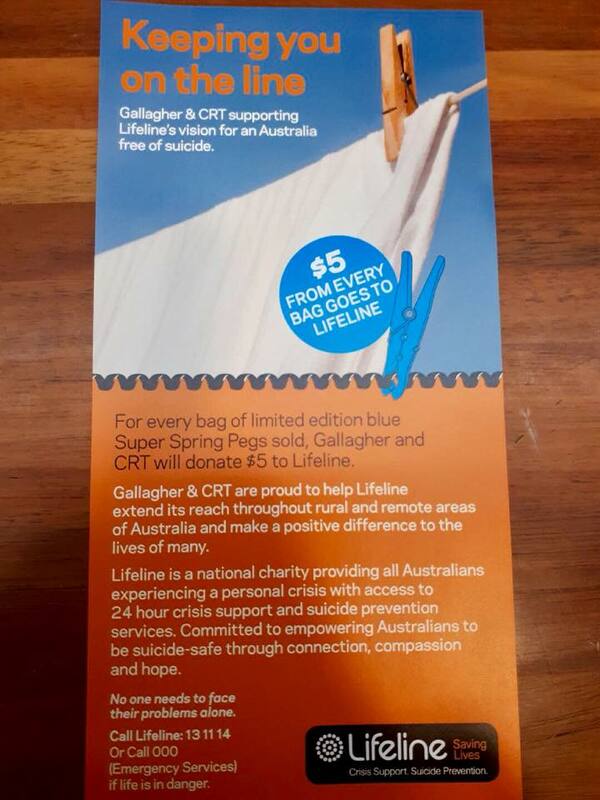 Gallagher & CRT joined forces in September 2018, selling limited edition blue Gallagher pegs and donating $5 from every bag of these pegs sold, to support Lifeline’s vision of a suicide-free Australia. Lifeline is a vital service across Australia (particularly in rural & remote areas), providing 24hr support to those suffering from depression and suicidal thoughts. Together, let’s support an Australia that is free of suicide! For more information, visit Lifeline. 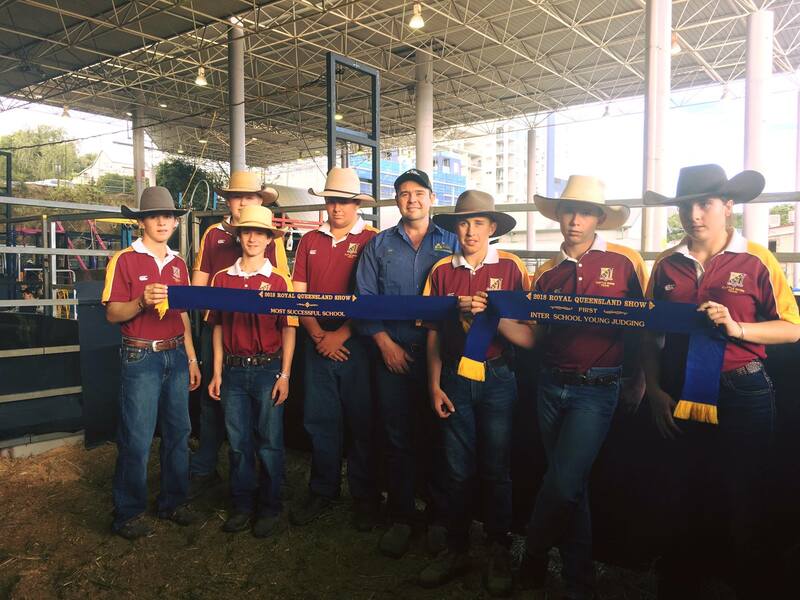 The Dalby State High School Show Cattle Team were blue ribbon winners at the Royal Queensland Show (the Ekka) in August 2018 and were awarded; Champion School Steer Young Judge, First place in Inter School Young Judging and Most Successful School! 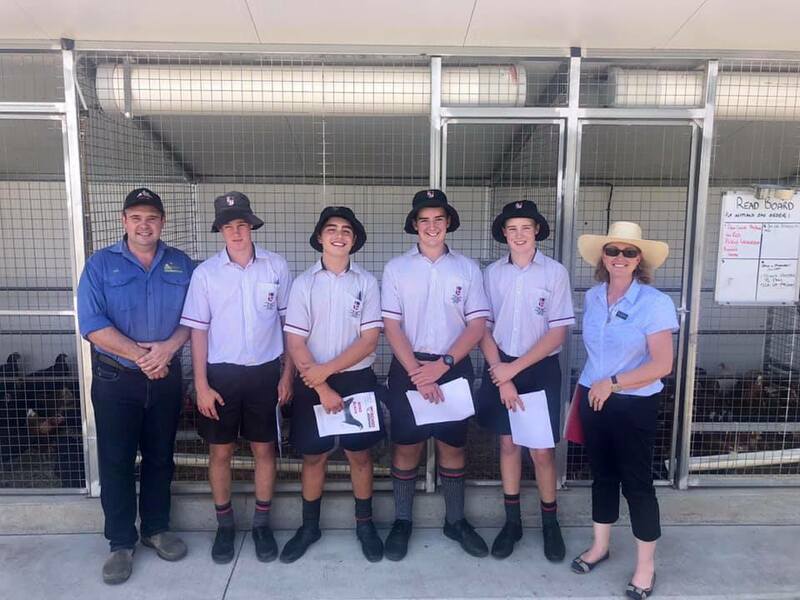 Dalby Rural Supplies is very proud to sponsor the DSHS Show Cattle Team and we love seeing the learning opportunities, progress and achievements of our future farmers and agricultural leaders. For the farmer, for the future. 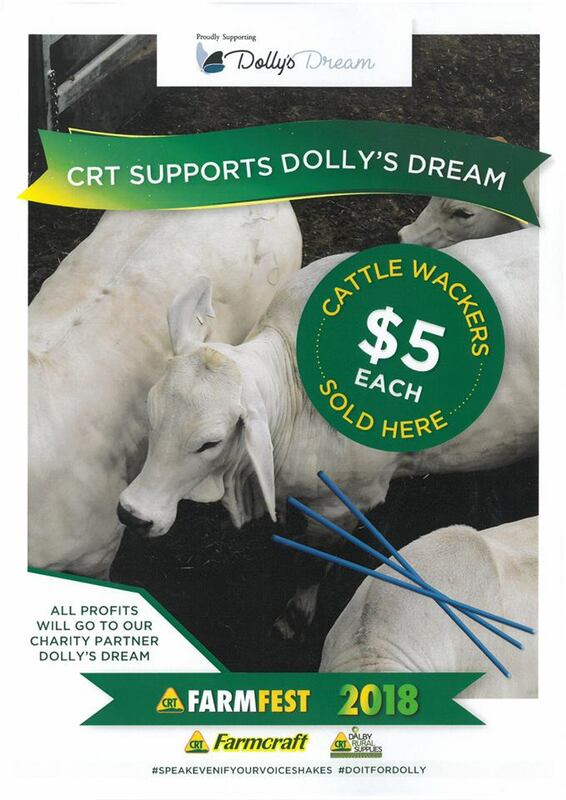 As part of CRT FarmFest 2018, Farmcraft & Dalby Rural Supplies decided to sell blue cattle wackers to raise funds for the Dolly's Dream Foundation. Dolly's Dream was established by Dolly's family and friends after she ended her own life at the young age of 14 because she was a victim of bullying. The foundation aims to prevent other children from being affected by bullying by raising awareness and supporting victims. For more information, visit Dolly's Dream. 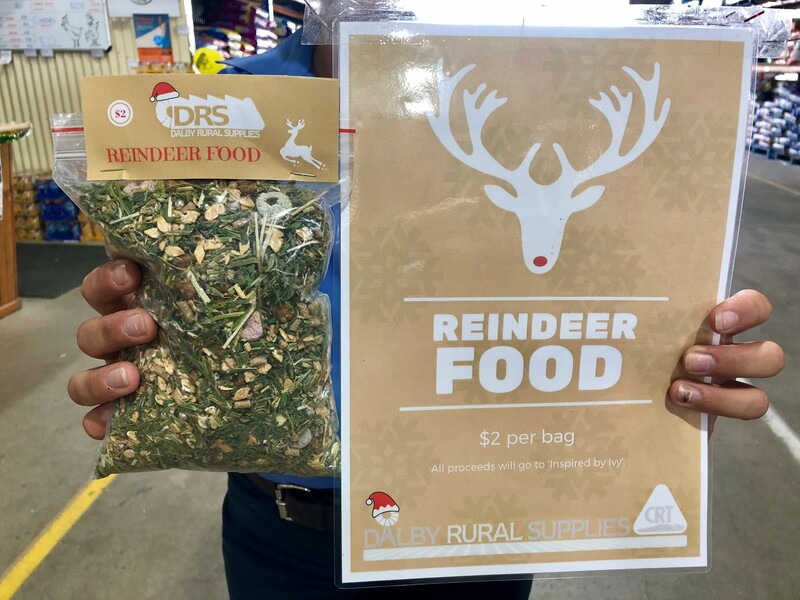 In December 2017, our team decided to raise some money for our local Dalby Soup Kitchen by expanding our animal produce range to include some reindeer food for sale in time for Christmas! At $2 per bag, the reindeer were kept well fed and happy and we were able to donate $150 to the soup kitchen. A sincere thankyou to all our customers who showed some Christmas cheer and helped to make this donation a reality. John and Andrew were proud to present Dalby State School staff and students a cheque for $5,000 at School Assembly on Monday, 15th May 2017, thanks to customers who shopped at Dalby Rural Supplies on Saturday, 6th May. 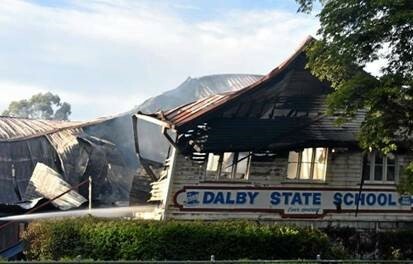 This donation has assisted with rebuilding after the devastating fire which destroyed the administration facilities, music room and two classrooms - buildings that were 150 years old and heritage listed. As a past student Andrew spoke about the School's proud history and the pivotal role it plays in educating Dalby's youth. He also mentioned how Dalby Rural Supplies was really keen to get involved and help out the School which is such a big part of our community. 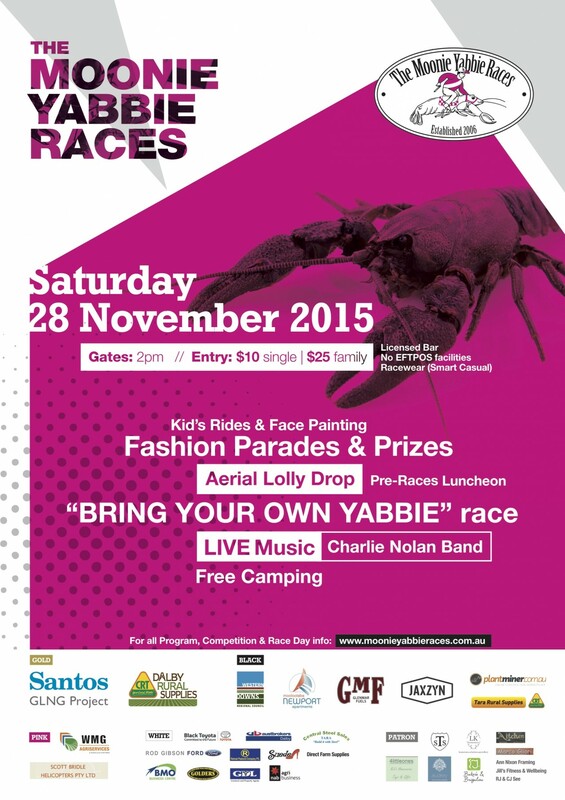 We are proud to be a sponsor of the Moonie Yabbie Races. It is a really fun family day out with plenty of entertainment including watching the races, fashions on the field, kids face painting, a helicopter lolly drop and free rides! At the end of the day there is also a firework show, brought to you by Dalby Rural Supplies! Hope to see you there! Dalby Rural Supplies is a major sponsor of the Dalby State High School Show Cattle Team, contributing approximately $5000.00 over a 3year period. Supporting this local Show Cattle Team helps to give the young members of our rural community who are involved in this team some support in experiencing and competing in one aspect of rural life. As a locally owned business, we see the importance of giving back to those in our local community and supporting causes that our customers are involved in and passionate about. 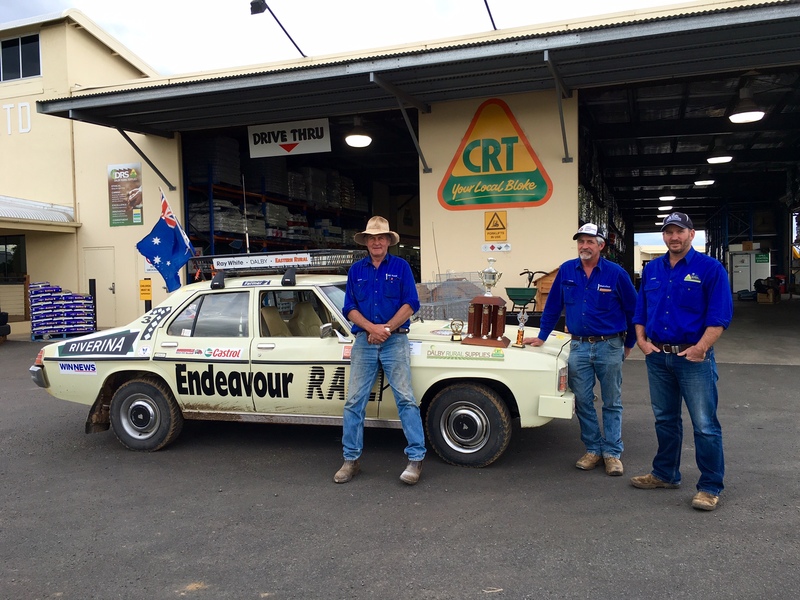 We sponsored Chris Bartlett in the 2016 Great Endeavour Rally and we were very proud to see him complete the rally and win many awards in the process! Dalby Rural Supplies is a major contributor to CareFlight as we believe it really is such an important service for rural communities. We have donated over $14,000.00 since December 2015 and we also have a CareFlight Workplace Giving Program where some of our staff members personally contribute to CareFlight as well through donating directly from their pay. Here are a few mission types CareFlight attends on a regular basis..you will notice how relevant these are for those in rural communities! 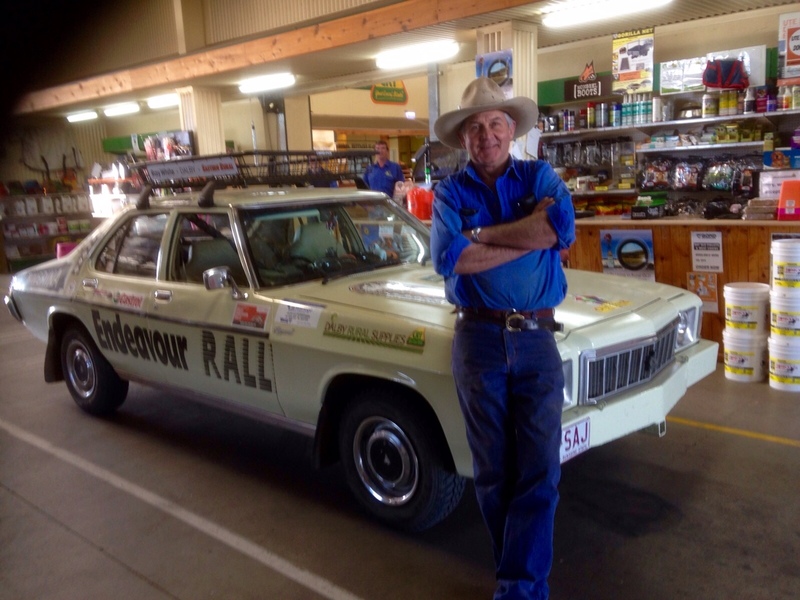 In November 2015 Ruralco committed to a three year corporate sponsorship with crisis support and suicide prevention organisation, Lifeline Australia. Lifeline partners with organisations who share a vision for an Australia free of suicide, and supports the delivery of mental health and crisis support based services to the community. Ruralco, CRT and Dalby Rural Supplies are acutely aware of our role and responsibility within remote and regional communities and the increased vulnerability of people in these areas who may be isolated from support services. 1 in 5 Australians will experience a mental health disorder in a twelve month period; and 45% of the population will experience a mental health disorder in their lifetime. 65,000 Australians attempt suicide each year. The rate of suicide with youths, farmers and indigenous people is double that of urban populations. More than 7 suicides are attempted every hour. 7 people die by suicide every day. In 2016, approximately 2,800 calls will be answered due to Ruralco's partnership commitment with Lifeline. It is our hope that this partnership will contribute to raising awareness of help-seeking behaviours, by engaging the rural and remote communities where CRT is present, and Ruralco and CRT member employees through a range of Lifeline activities and mental health awareness programs. We hope this will help the communities we serve to be more resilient and suicide safe. For more information about this partnership visit the Lifeline and Ruralco partnership media release. 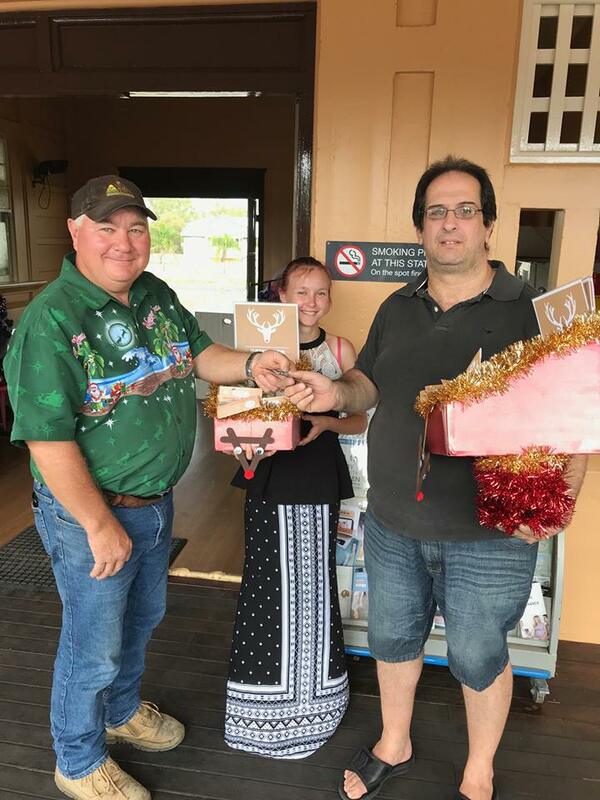 As a Christmas gift for 2015, the partners of Dalby Rural Supplies donated a whopping and much needed $8,000 to CareFlight on behalf of the business and their valued customers! The south west region is the busiest of all CareFlight centres, with the Toowoomba based chopper regularly attending over 10 emergency requests for help each week. 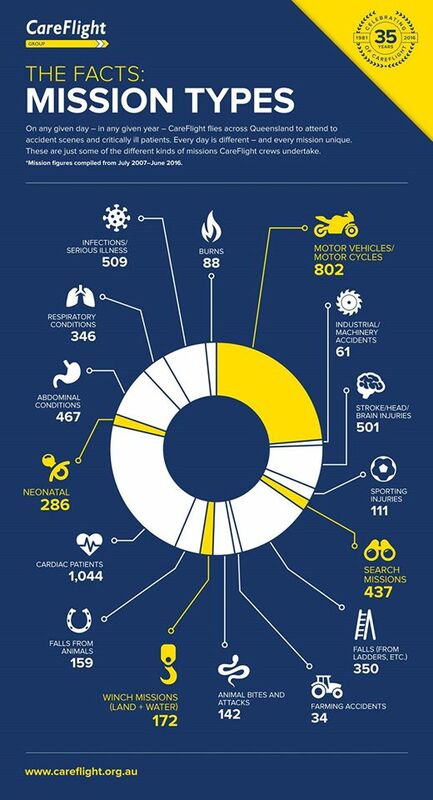 Last year, among other rescues, the south west CareFlight crew attended 97 primary accidents - 35 of which involved a motor vehicle. Many of the others were on-farm accidents including quad bikes, horse accidents and cattle yard incidents - with some of these being to help members of our community quite possibly a member of your very own family, a friend or an acquaintance. An average mission can cost $12,500 however this is a small price to pay for the life of a loved one. CareFlight's rescue helicopters are regularly sent to serious accidents, where early medical intervention can often be the difference between life and death. Dalby Rural Supplies feels that this vital service has touched the majority of the community in some way and they are proud to support such a worthy cause. 2015 was the 10th annual Moonie Yabbies Races! The event is a fantastic day filled with yabbie races, fashions of the field, jumping castles, rock climbing, sweeps, raffles and live music courtesy of the Charlie Nolan Band. 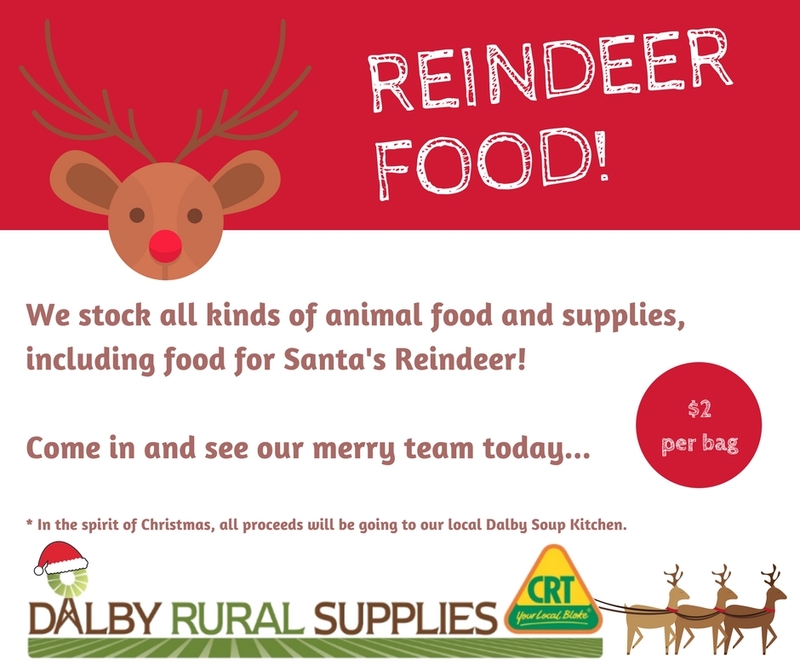 Dalby Rural Supplies is proud to be a supporter of this wonderful community event. For more information visit the Moonie Yabbie Races website. 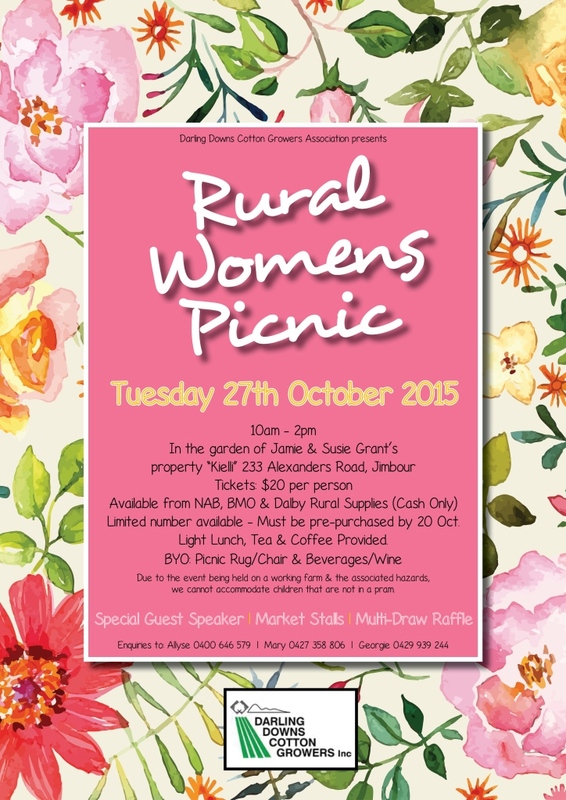 Dalby Rural Supplies was proud to be involved with selling tickets for the Darling Downs Cotton Growers Rural Women’s Picnic held on Tuesday 27th October 2015 at Jamie & Susie Grant's property, Kielli. 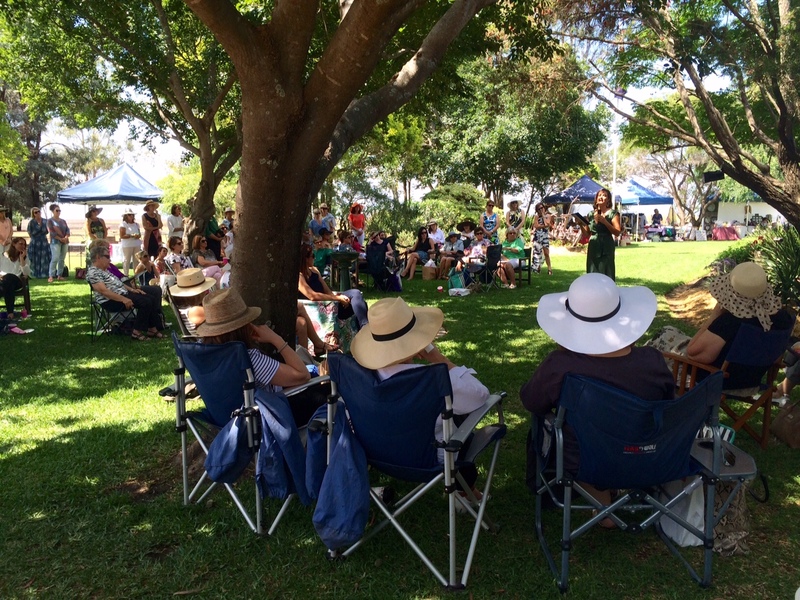 Approximately 140 women attended the day which consisted of enjoying lunch & drinks in Jamie & Susie's gorgeous garden, a dash of shopping with the attendance of a few stall holders and listening to inspirational guest speaker Edwina Robertson - the photographer who recently went viral on social media due to her photos of a wedding at Blackall which showed the devastation of the drought. A fantastic day all round and we look forward to the possibility of similar events in future! For more information contact Darling Downs Cotton Growers Association. 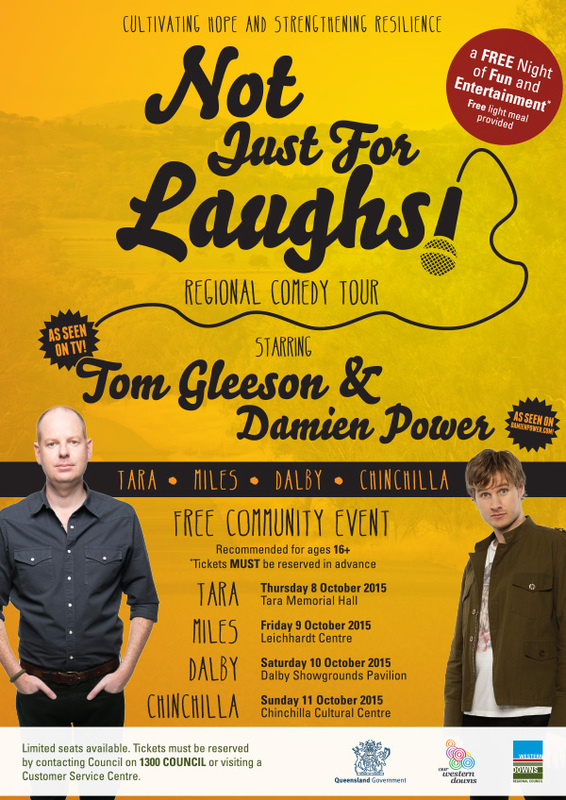 On Saturday 10th October 2015, the Western Downs Regional Council hosted a free 'Not Just For Laughs Regional Comedy Tour' at the Dalby Showgrounds featuring well-known comedians Tom Gleeson and Damien Power. The aim of this event was to give rural people, who may be affected by the current drought conditions, a free night of entertainment to lift spirits, promote healthy socialisation and circulate information to address mental health issues in our area. Dalby Rural Supplies was proud to support this event for the local community. 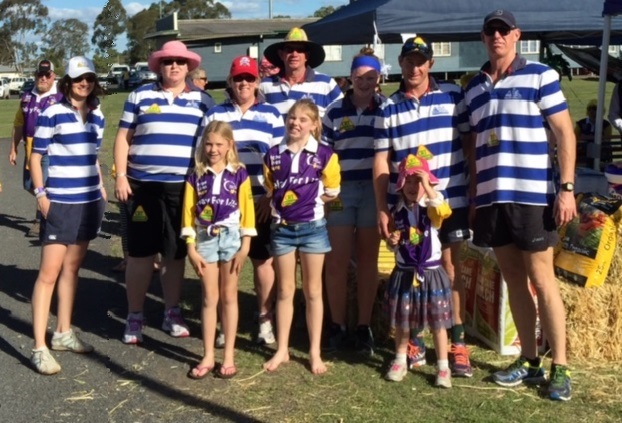 In September 2015, Dalby Rural Supplies joined the fight against cancer by participating in the Dalby Relay For Life walk at the Dalby Showgrounds. Relay For Life is a fundraising event run by the Cancer Council in order to raise vital funds for cancer research, prevention, information and support services. We were able to raise approximately $2600.00 thanks to the generous support of our customers, suppliers, anonymous donors, staff and those who purchased our raffle tickets on the day. Dalby Rural Supplies is proud to support RACQ LifeFlight through the Workplace Giving initiative. We actively encourage our staff to show their support for our local LifeFlight Rescue service. For more information visit LifeFlight Workplace Giving. 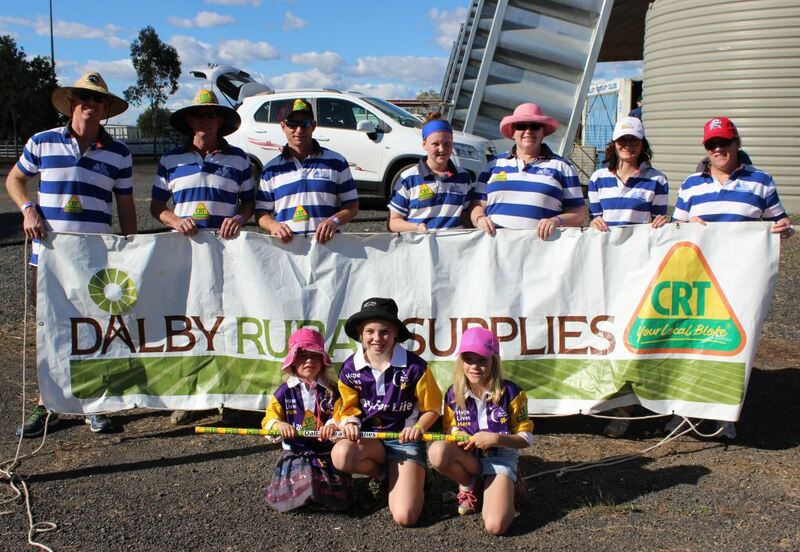 Dalby Rural Supplies is a proud supporter of the Dalby Rugby Union Club - Wheatmen. As a workplace we are heavily involved in the club both as a major sponsor as well as having several staff members participating as coaches, players and volunteers. We look forward to continuing our partnership for many years to come! 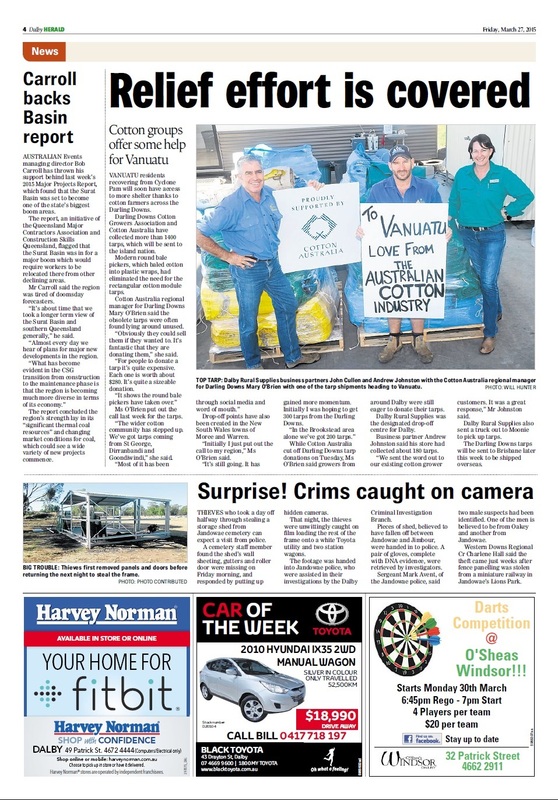 Thanks to Cotton Australia's initiative, Darling Downs cotton growers were able to contribute to the relief effort following the devastation of Cyclone Pam in Vanuatu in March 2015. 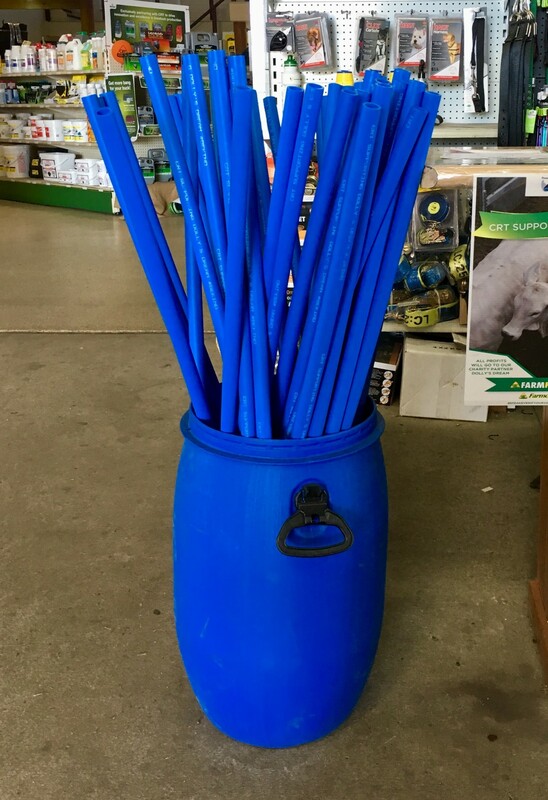 Hundreds of cotton tarps were collected and sent over to help the people of Vanuatu to recover and Dalby Rural Supplies was more than happy to contribute by promoting to cause to our local customers and being a collection point for the tarps on the Darling Downs. 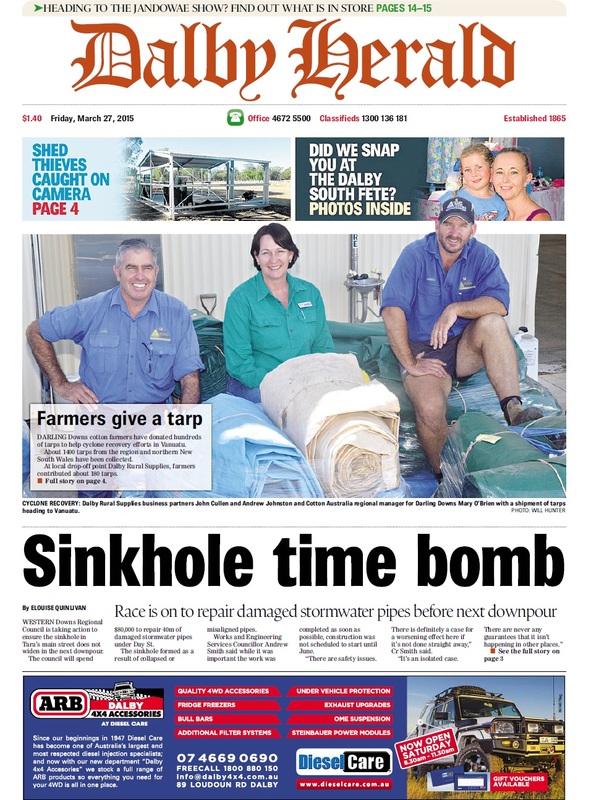 For more information see the full sized photo and article printed in the Dalby Herald on Friday 27th March. 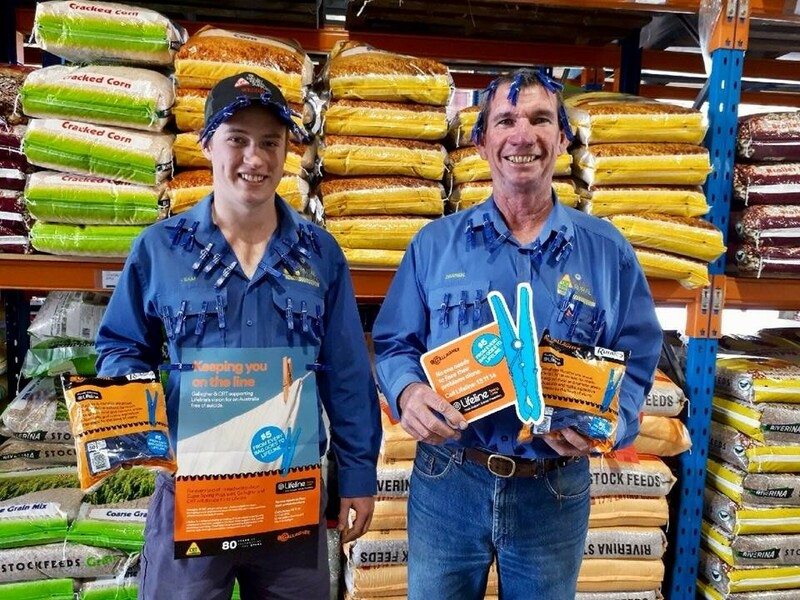 Dalby Rural Supplies is a proud supporter of the Think Local Love Dalby campaign and we are very keen to see our rural customers and more of the community involved to generate a stronger sense of community spirit! For more information visit the Think Local Love Dalby Facebook page. 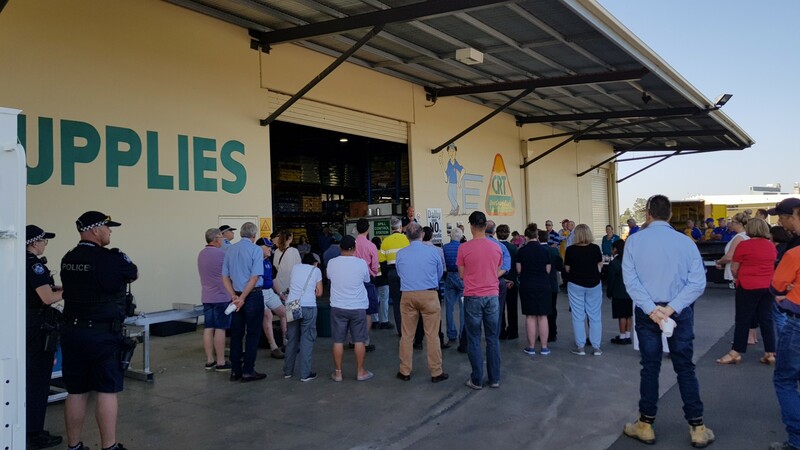 Dalby Rural Supplies aims to not only provide exceptional service through quality advice and products, but to also give back to clients and the local community. In 2013, with generous support from our suppliers and clients we were able to raise funds for a much needed Care Room at our local Dalby Hospital. Initially the aim was to set the room up as a Breast Cancer support room; a place where survivors could hold meetings or a one on one session with the local Jane McGrath nurse. Through the process of refurbishment, it was recognised that the room could also be used by family of current patients who needed time away from the ward or with specialists. It also has the function of being an area for staff to hold debriefing sessions. The funds raised enabled the room to be repainted, a kitchenette installed, new flooring put down, air conditioning installed and also to be furnished with couches, coffee tables and a TV. 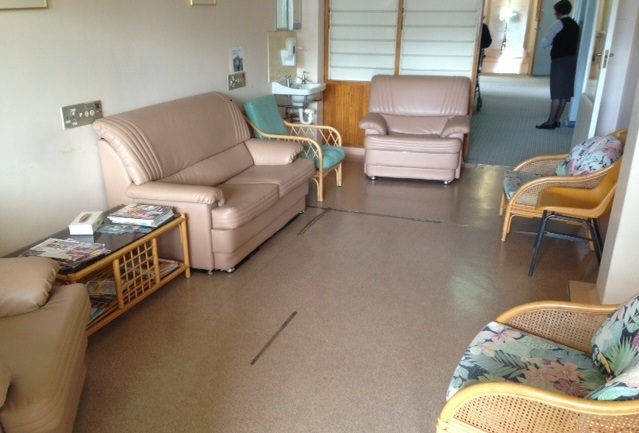 With the final renovations and re-furnishing of the room being completed in early 2014, the tastefully decorated Care Room is now used on a daily basis. ‘The room gives a comforting environment for some time out. With beautiful furniture and decorating, a kitchenette and television, it takes them away from the clinical environment of the hospital, but is in close proximity to their loved one. The Dalby Care Room located in the upstairs area of Acute is a credit to Dalby Rural Supplies and shows just how much the community are involved with their local hospital.’ - Colleen Rasmussion DON/FM & Maree Wylie McGrath Breast Care Nurse/Community Palliative Care Coordinator.